Sometimes….just simple splashy watercolor is just the right thing to do. Easy peasy, flick it on and let the watercolor sing! In the video I talk a little about colors to avoid together, and a few general tips. Enjoy the video below or click HERE to see it in HD on YouTube. The stamps used here are so pretty and versatile – these could be sent any time of year, any occasion! 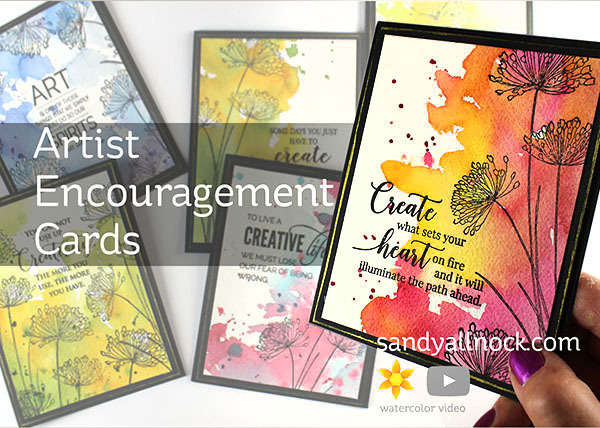 Just pick a fellow artist/crafter and send out a little encouragement by mail! Your cards are so beautiful. Thank you for the video and all the tips you shared. I love these! As always, thanks for the creative motivation. Sandy, your cards it’s so fabulous ! Good work ! I love these cards ! Thank you for the great and clear video, you make it look do-able. Thank you ! Oh I have to do this. 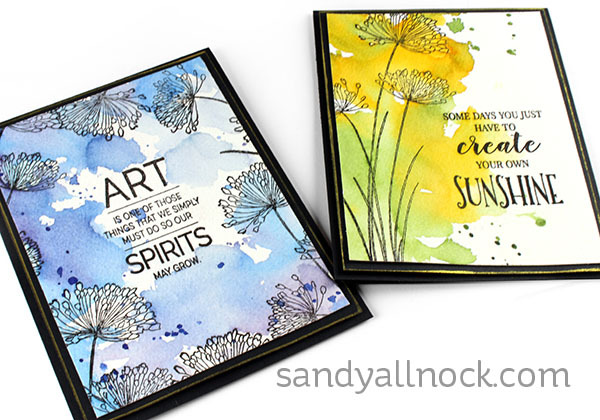 I love the look and fun water color free-ness..
Great cards and idea to try out your watercolours like this. I love the sentiments you used. Thanks you so much and have a nice weekend. It looks like so much fun making these. The sentiments were ideal and now added to my wish list. So beautiful. I have some flowers and was wondering how to use them and now I found a great way. Sandy thank you do much for listing colors that go well together. I have a master’s degree and have no clue about color. I am the poster child for color illiteracy. I love DS so any other suggestions would be appreciated. You are the best. Dang–the sentiments are perfect for a artist friend of mine who is blocked right now but they’re sold out on Ellen Hutson. Added them to my wishlist and to be notified when they’re back in stock. Thanks for the great inspiration! These are beautiful. Thank you for my beautiful bookmark. What a sweet surprise. Now this is something I may be able to do, they are so pretty! So pretty! Love the loose style and the touch of gold. Beautiful, Sandy!! Very uplifting, and love, love, love your watercoloring! Gorgeous cards Thanks for the video! 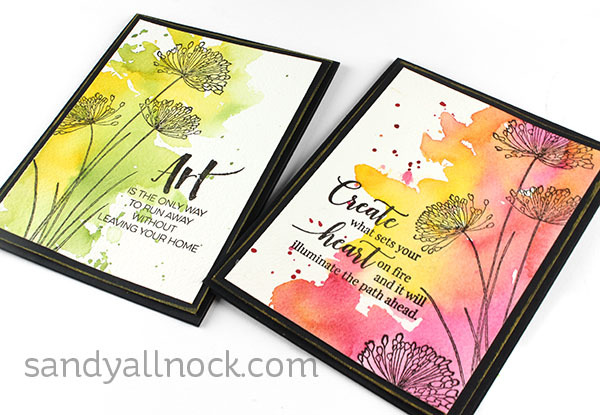 Love LOVE your loose arty cards. I hope you do lots more loose or sketchy (in a good way!) cards. Yes, a great way to just play with what we have to get familiar with mixing colours. Lots of great tips and ideas. Thanks Sandy. Tons of great tips here, not just on mixing colors, but on that whole idea of letting go and being loose with the paints. Thank you! Gorgeous and fun! Cannot wait to try this using the supplies I have.